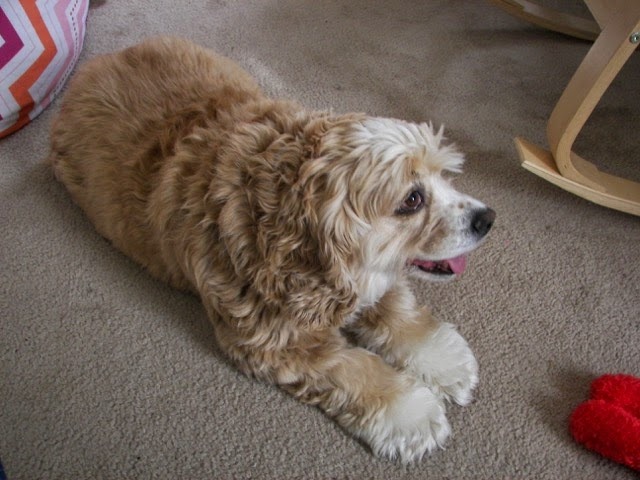 OBG Cocker Connection: The Official Blog of Oldies But Goodies Cocker Rescue: Molly's Pupdate! Happy 1st Gotcha Anniversary to Molly (formerly Nora)! Such a beautiful girl! We were so happy to receive this pupdate from her Mom. Happy New Year, Molly and Maggie! I wanted to send an updated photo of Nora (now Molly) who I adopted through OBG on Jan. 4, 2014. She is doing just great! She is the master of the dog door and loves going outside to defend her yard against the squirrels. Molly is much more affectionate than when I first got her and loves being brushed. She's a real joy. Thanks!